An alumnus of Sri Sathya Sai Institute of Higher Learning, Gaurav joined the Sri Sathya Sai Higher Secondary School in 2004 and later pursued his Bachelors in Commerce (Hons) and Masters in Business Administration (Finance) in the Brindavan and Prasanthi Nilayam campuses respectively. A brilliant student, he was the Gold Medalist in both these courses. Subsequently, he worked for about an year in New India Assurance Company Ltd. Currently he is busy preparing for Indian Civil Services examinations. To mould well-rounded holistic individuals – professionally sound, socially responsible and spiritually aware - who embody noble values and a right attitude, through Educare (Integral Education based on Human Values) that caters to the physical, intellectual, emotional, psychological and spiritual dimensions of human personality. This mission, with educare as its cornerstone, successfully plays out silently every single day of a Sai student’s life. However, its clearest expression is to be found in a slice of a little over a month of the annual calendar of Sai institutions. This period, perched across the months of December-January, can verily be said to be the crystallisation of the Educare mission in just six words – ‘The Annual Sports and Cultural Meet’. Students! Our institute students should realize that the games and the music are meant for happiness and health. The sports demonstrate the 'Unity in diversity'. Though students come from different places, cultures and ideologies, all that should come together in oneness in sports and absorb this message. All should live like brothers. But, all of these must be practiced with the feeling of dedication to God. Work will be transformed into worship. More than a decade has passed since I participated in my first “Sports Meet” (as the Annual Sports and Cultural Meet is colloquially known) in January 2005, and the intervening period has given me many opportunities to reflect on its teachings and significance. And the more I reflect, the more its educational and transformational power grows in my mind. In fact, it would not be an exaggeration to deem the Sports Meet a separate educational course in the academic calendar – in which the teaching, the learning, the examination and the evaluation, all happen simultaneously. At the individual level, the Sports Meet gives an opportunity to students to learn various skills. The most obvious are related to the events in which they participate – like martial arts, gymnastics, dramatics, dance, etc. However, less obvious soft skills like people management and guest management are also inculcated. For instance, during the 2009 Sports Meet I was given the responsibility of looking after the lodging and meals of the international coaches for the Lion and Dragon dance events. This gave me the opportunity of playing the host, serving them meals and even waiting on their tables! It was a wonderful lesson in patience, humility and sensitivity. For most students, the Sports Meet provides them their first tryst with adventure or the arts. This was definitely true for me when I performed certain acrobatic manoeuvres in the motorbike stunts event in the 2007 Sports Meet. This forced a docile and timid boy, unaccustomed to speed or great heights, to face his fears and embrace, nay conquer, them; for fear is, after all, wisdom in the face of danger. It also engendered in me a lasting allegiance to physical fitness. Sports Meet is also an educator extraordinaire in the subject of group dynamics. Here we learn that a team is not a mechanism, but an organism. Each sub-group within a team and even each person is not a mere cog, but has a unique vibrancy to contribute. This is especially seen in the event of an unforeseen contingency. It was the 2008 Sports Meet, and I was an acrobat member of the 'Celestial Rhythms' event performed by the Brindavan campus of the Sri Sathya Sai Institute of Higher Learning. This involved a team of 24 performing synchronised acrobatics on a huge vertical grid suspended 80 feet above the ground with the help of a crane. Throughout the practise sessions, the acrobats on the grid were the cynosure of the spectators’ eye, engendering an unconscious belief in us that “we” were the entire team – the beginning, the middle and end of it. But the sequence of events on the day of performance on January 11 showed us what actually knotted the beginning and end to form a perfect garland. Just before the event was to start, all the acrobats got into their positions on the grid which was hovering a few feet above the ground. Then the grid was gradually lifted by the crane to be eventually placed at its destination 80 feet above. This delicate manoeuvre proceeded smoothly until the grid was almost in place. But just then, all of us felt a sickening jolt as the entire grid suddenly swayed with a start and wobbled uncomfortably. However, the imbalance was only momentary. The grid soon stabilized, the event began and went on successfully. It was only after the event that we came to know what had happened. One of the anchoring pegs, which stabilize the grid and are dug deep into the ground, had become loose causing the grid to dangerously wobble. This mishap was compounded by the fact that wind speeds at a height of 80 feet can be quite gusty and the huge grid provided a large resistance to the wind. Yet nothing untoward happened because the ground staff immediately jumped into action, caught hold of the renegade peg and stabilized the grid with their bare hands until the peg could be dug back into the ground. This was an eye-opening insight into the working of a team. A team is like an iceberg. What meets the eye is only a small part which is above the surface of the water, in reality, a larger part holds the former on its shoulders while itself being out-of-breath underwater. The Sports Meet also holds aloft the message of community-building and harmonious living. Participation in certain events broadens mental horizons and opens up the mind. For instance, a Keralite participating in the Gotipua folk dance of Odisha or an Odia sweating it out in the Kalaripayattu martial art of Kerala leads to what Teilhard de Chardin called ‘entering into the consciousness of another’. This involves an inevitable acceptance of difference, resulting in true ‘unity in diversity’. Thus, the Sports Meet is not just a community-builder, it is also a nation-builder. It does not limit this expansion of consciousness to the national level alone. Students participate in the cultural events of other countries too (like the Chinese Lion and Dragon dances). And in doing so, they also partake of their tradition. This prepares the seedbed for cosmopolitanism, what in the Mahopanishad is stated as “Vasudaiva Kutumbakam’. In myriad other ways, the Sports Meet therefore acts as one of the major platforms for the edifice of educare to be built. Indeed, Swami has always held that Education is for life and not for mere living. While the latter aspect is catered to by the formal education in the Sai schools and colleges, the former is provided by events like the Sports Meet. 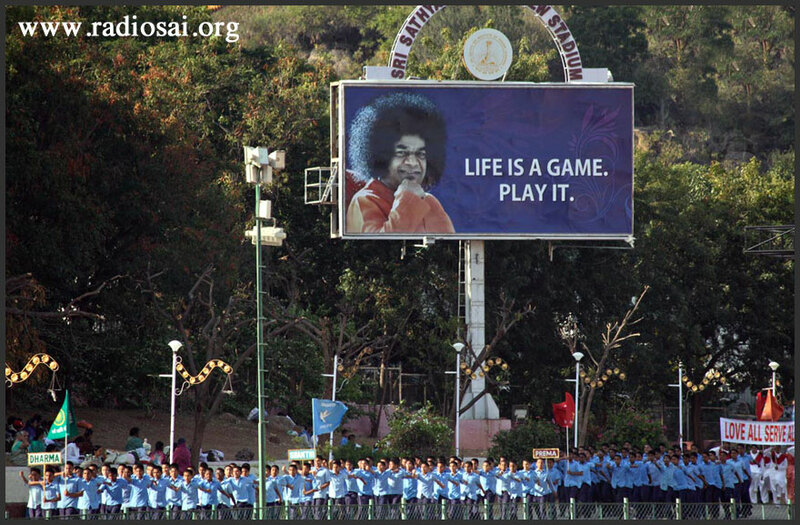 The educational end apart, the Sports Meet also serves a more personal purpose for both Swami and His Students. It serves as a medium of communication between the Mother and the children. In no other event is this seen as clearly as in the march past. Swami gives the utmost importance to march past, and has particularly emphasised that every student should participate in it. For Swami, marching matters so much because it brings Him pride and happiness in seeing His children move forward with their heads held high, chests held strong, and arms swinging ahead confidently cleaving through any barrier that should be unfortunate enough to challenge their progress. For the students, it is an opportunity to make Swami happy and to bask in the warmth of His pride. In front of the Shanti Vedika, as they turn their necks to look at Him, they transform into sunflowers facing their energy-source, vindicating the sobriquet to humankind – “children of the sun”. It is then that their faces capture the radiance of their Lord while giving out a brilliance of their own – an offering and a response at the same time. This heart-to-heart connection is also palpably felt during the oath taking ceremony at the inauguration of the Sports Meet. From ‘We the children of Sai...’ to ‘...our beloved Mother Sai’ the oath is a promise of children to their mother, a promise to channel personal excellence towards larger purposes - "for the honour of our country, glory of sport and our Beloved Mother Sai". And like the march past, this too is a moment of pride and triumph for our Lord; to hear the collective voice of His students roaring and soaring like waves crashing on the shore - strong yet caressing. Embodiments of Love! Students! Whatever small act you undertake wholeheartedly, makes Me happy. Your games are not confined to the games you participated in for few days. You should engage yourselves in games all the time. In your walking, talking, listening, thinking and in your actions, there should be perfect unity. That is the culture of Bharath. The Indian culture always stressed on the point, “Speak the Truth and follow the path of Dharma”. I was blessed to see Swami’s response to one such oath chanting when, as the University Captain in the 2011 Sports Meet, I could administer the oath to all the students. As soon as I finished reading the last phrase ‘…and our beloved Mother Sai’ from the enclosed area at the foot of the Shanti Vedika, one of the brothers standing behind me hurriedly indicated to me to look at Swami on the Shanti Vedika. When I looked, I was witness to a scene as refreshing as the sweet scent of first rain on earth - tears of joy in the Lord’s eye, dew drops of love sparkling on the ocean of compassion. Sports Meet is, therefore, the time when students vindicate and live up to Swami’s claim that we are His property; but in more ways than is evident. When Swami calls His students His property, He uses the term property not merely in its common meaning of ‘owned belonging’, which does hold true (we belong to Swami as a child belongs to its mother, and Swami owns us as our in-dweller just as we own our bodies). Swami gives His students much more importance and agency than that. To my mind, Swami uses the term property in the sense of 'quality' or 'characteristic'. Swami calls His students His qualities. Students! I have been watching and noticing all the struggle and strain that you have undergone during this past one week. You work sacrificing food, drink and even sleep. Our students are striving for the satisfaction of Swami. So, when the students create a bewildering palimpsest of colour and courage, music and message during the Sports and Cultural Meet, it is Swami who is the performer, the performance and the witness. Students are the pixels, Swami the picture; students the colour, Swami the canvas; students the motion, Swami the medium; students the action, Swami the aspiration.